How could you solve Apple iPhoto woes? As it turns out to have a thounds of photos in iPhoto library, and when you tries to open iPhoto, the spinning beach ball appears for five minutes, and you are never able to get to your library. In Mac OS X, iPhoto is a great tool for most of us, but sometimes it can give us fits. Luckily, there are a couple of ways to solve this problem, so if you, too, cannot open iPhoto (or if it crashes when you do), read on. Note: Rebuilding your iPhoto database could make things worse, and you could lose your data. If you don’t have a backup of your iPhoto database that you can restore, think twice before you continue. Make sure iPhoto is closed. Hold down the command and option keys, and while continuing to hold them down, open iPhoto. Notice that we have several options in this window, so let me just explain them. If iPhoto won’t even open, you probably don’t have to worry about the first two: they have to do with rebuilding thumbnails of your images. So unless the problem you’re having is that you don’t see thumbnails of your photos (but you can see the full-sized photos), you can uncheck the first two items. This will save time in rebuilding your library. 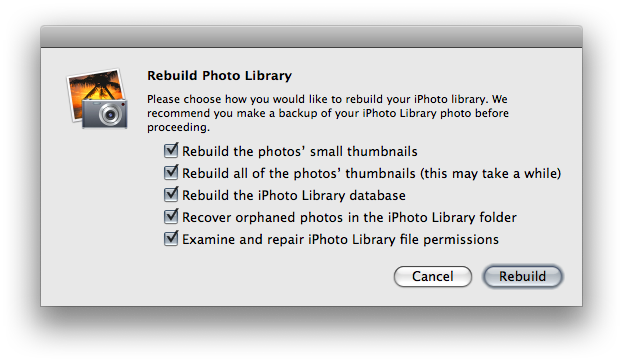 I would leave checked at least Rebuild the iPhoto Library database and Examine and repair iPhoto Library file permissions (note that this last one only appears in iPhoto ’08 and later). These two options will do all of the work for us trying to fix our library. The fourth option, recovering orphaned photos, can be selected if you think iPhoto is not showing you some of the photos that were previously shown (as though they’ve gone missing). This option will look for those photos. Click Rebuild, and give iPhoto some time. A minute or two, or even an hour or two. It needs its time. If everything goes well, iPhoto will open to your library, and all photos will be accounted for. To manually fix your library, we’re going to create a new, empty library, and try to import your old photos into the new library. While this is a safer option than method above (you’re less likely to lose data if the library is truly corrupt), you may find that only some photos import, and it will be a royal pain to try to manually find the missing photos if that occurs. This means that if everything goes smoothly, great — but if it doesn’t, this process can take a while. Click Create New to make a new iPhoto library. After the new, empty library appears on screen, hide your iPhoto application so we can see the Desktop. From the Desktop, navigate into your Home folder (/Users/username), then into your Pictures folder. You should see your original iPhoto library and your new created iPhoto library (as they must have different names). The two folders I have circled are the ones we care about. 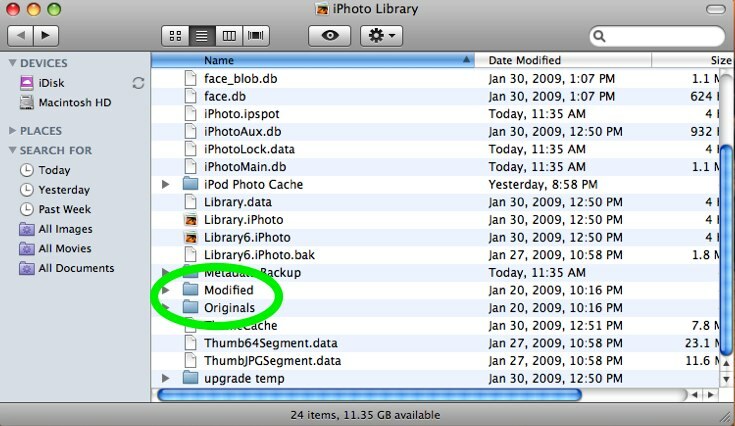 Originals should contain the original photos you imported from your digital camera. Modified contains photos that you have changed within iPhoto. This means the two folders may contain the same photos, and if you import both folders, you may end up with duplicates. Now you want to drag the Originals folder onto the iPhoto icon in the Dock. 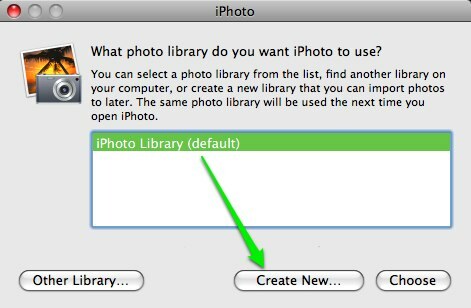 This will begin the process of adding your photos to the new iPhoto library. Once this is completed, feel free to drag the Modified folder onto the iPhoto icon in the Dock if you also want to import those photos. If you don’t care about specific modifications you’ve already made, I wouldn’t import the folder, as you’ll have to sort out many duplicates. Hopefully, all of your original photos get imported into your new library. If so, congratulations! You’ve successfully rebuilt your iPhoto library, and you can delete the old one. Now, iPhoto will always open with the new library. If, however, some of your photos are missing, your only option is to manually go through your Originals and Modified folders, one by one, to try to find the missing files. As you’ll see, those folders are organized by the date (first year, then month, then day) the photos were taken. If you find missing photos, you can try dragging those folders onto iPhoto to import them. If that does not work, you’ll need to open them in another application and re-save the files as different photos (you could try using Preview for this), then importing them back into iPhoto. Did this troubleshooting tutorial work for you? Have you had similar experiences in iPhoto? Have you found a better way to fix iPhoto library problems? Let others know in the comments section.